I know it’s hard to read about the cooking class and not be interested in the recipes!! You know me, I try to save my sugar treats for Sundays (but it didn’t stop me from enjoying some of my daughter’s warm gingerbread with applesauce last night -oops!) , so here is a recipe of a special treat. Only 5 things needed from the grocery store! Oh yeah, and if you are making it for a friend who doesn’t love coffee as much as you and I do, then hot chocolate could suffice. Mix the egg yolks with the sugar, whipping until they are white-ish and doubled in volume. Prepare coffee and let it cool down. Add the cheese to the egg yolks, progressively to reach maximum whipping speed. Let the mixer mount the cheese very firmly. In a separate bowl, beat the egg whites and the pinch of salt, until stiff. Fold egg whites into the egg yolk/cheese mixture. In a serving dish, layer a spoonful of this tiramisu cream. Then take the cookies, one by one and dip them briefly in the coffee; lay them side by side in the bottom of the dish on top of the cream. Pour another layer of cream, then “coffeed” cookies. Put the cream and the cookies (dipped in coffee) in alternating layers until top of dish or out of ingredients. Over the last cream layer, sprinkle the chocolate drops or cocoa powder. Tradition is cocoa powder. The right proportion is 100g marscarpone , one egg and 2T sugar for every person. “Venice and Treviso claim the origin of this dessert, both towns were famous in the 1600’s for their art… This dessert was an instant boost in energy for them, coffee, sugar, eggs and cookies. 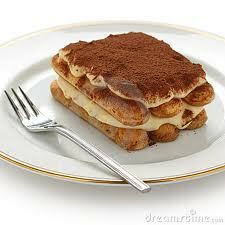 Exactly the PICK ME UP – this is what tiramisu means –they needed between…tasks.” Semi-quoted from my class’s notes. This entry was posted in Recipes, Travel by Terri. Bookmark the permalink. That looks good! And fairly easy. Definitely will try. 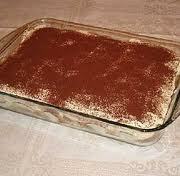 Tiramisu is not only the perfect dessert, but my favorite too:) Nice and light, with coffee and dessert in one! 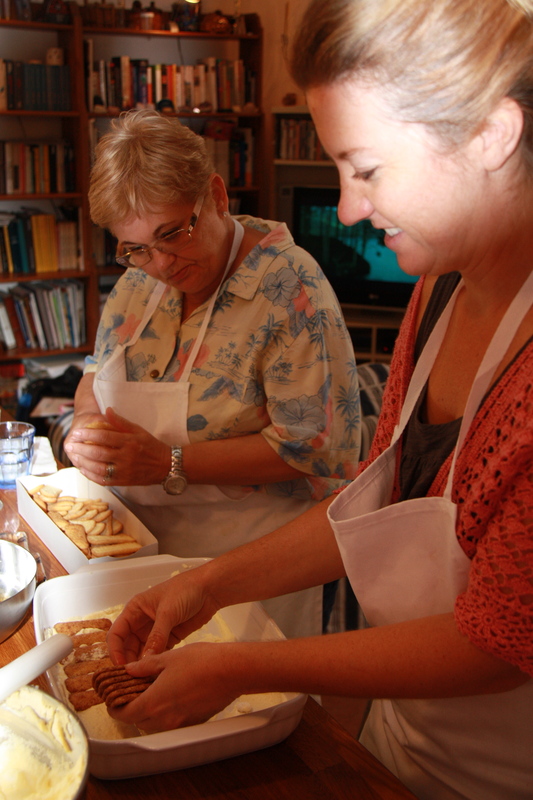 Thanks for sharing a great recipe straight from Italy. Thank you Terri! I’ll be attempting that for sure! it’s one of my in-laws favorites!!!! Thanks so much for this recipe, Terri!!! I am making it to have with the Lasagne and Garlic Bread I am doing for Christmas dinner. I informed my family (including adult kids) if Mom was expected to do most of Christmas dinner, like I did for Thanksgiving, I was making a SIMPLE menu, so I could make it before-hand. That way, instead of spending all day Christmas cooking, I could relax and enjoy their company . . .